Micki Valdez, Maria Dioseline Valdez, 8-month-old Santiago Valdez and Gabriela Miranda Valdez sit in downtown Nogales after a shopping trip to the United States. 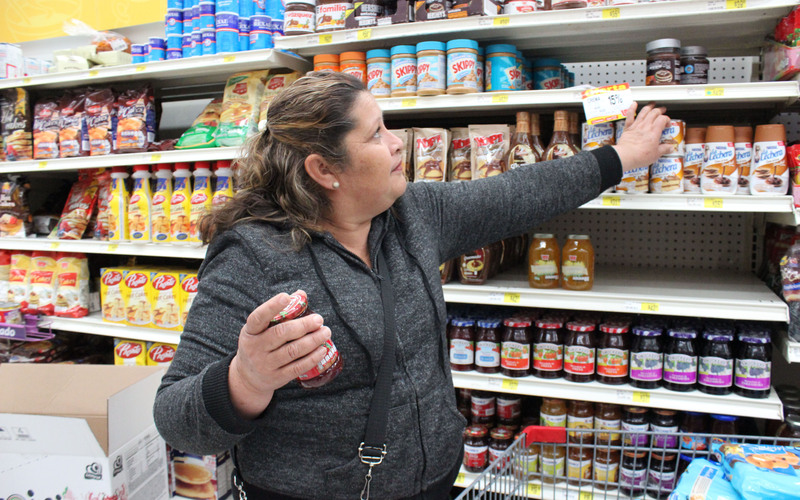 Maria Elena Ramos Hernandez shops for food items at La Ley supermarket. She usually takes large shopping trips during the weekends. Pedro Franco stands at the downtown Nogales port of entry into the United States from Mexico. He uses his cart to help people cross with groceries they buy across the border. Maria Elena Ramos Hernandez buys plantains at La Ley supermarket in Nogales, Sonora, Mexico. Produce is one of the few items sold cheaper in Mexico. On the surface, integration between the countries is growing. Cars are no longer made in the United States but in North America. Even the two-hour lunch is at risk as Mexicans try to mimic U.S.-style meals, quick and on-the-run. But the activity at the crossing is evidence that this integration isn’t present in the supermarkets, which see prices so much higher in Mexico than in the U.S. that shoppers surge across the border seeking better deals. High import costs on items coming into Mexico are the key to why this phenomenon occurs, said Carlos Jimenez, president of the chamber of commerce for Nogales, Mexico. 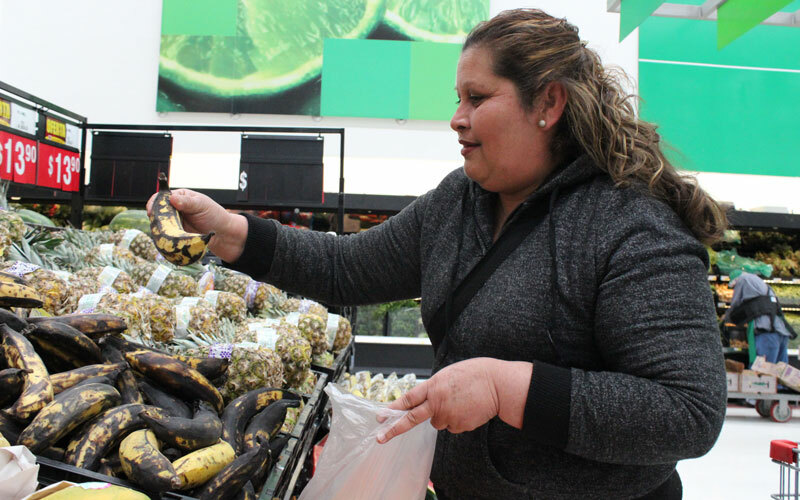 Prices are higher in Mexico due to import costs and supermarket prices being set where those markets are headquartered, in locations that aren’t on the border and don’t have to compete with cheaper U.S. prices. Added to those prices is a 2014 raise in sales taxes on the border on non-food items, from 11 to 16 percent, which means stores aren’t able to compete with the U.S. on certain goods. The raise came from a central government decision to place a flat sales tax across the country after decades of border towns receiving a lower tax rate in order to remain competitive, Jimenez said. The tax increase equated to a 25 to 30 percent decrease in purchasing power for those on the Mexican side. Overall, the crossings are a large portion of cross-border economics, which saw $590 billion in trade between the U.S. and Mexico in fiscal year 2015, according to Christopher Teal, Nogales’ U.S. consul general. But in Mexico, there are downsides. The barriers to crossing are many, from long lines to ineligibility for crossing cards to low wages. According to the U.S. Department of State website, a crossing card that allows Mexican citizens to enter the United States temporarily costs $160. In Mexico, the minimum daily salary is 73.04 pesos, or just over $4, depending on the exchange rate. Still, despite the barriers, the shoppers are so many that a few provide options that allow shoppers to get goods across the border. Consider Pedro Franco, 55. He uses a shopping cart to shuttle groceries back and forth across the border for other cross-border shoppers. Franco often stands with his cart directly outside the downtown Nogales pedestrian crossing and usually crosses with shoppers who can’t carry or transport everything themselves. However, sometimes he crosses and shops for people who, due to time or eligibility constraints, can’t cross the border themselves. He takes his pay entirely in tips. Maria Elena Ramos Hernandez crosses into the U.S. to shop on Saturdays. There, she buys meat, milk and juice, goods she say that cost less but are of higher quality. At La Ley supermarket on the Mexico side in February, she points out that milk costs $3 and is, as Ramos describes it, “pura agua,” or entirely water. Her family makes about 1,000 pesos (about $60) per week, between her husband’s income and the money Ramos receives once every three months from the Hogar de Esperanza y Paz, the community center where she works. Ramos’ experience reflects those of many living on the border in Nogales. While some items, like produce, are cheaper in Mexico, she buys most of her groceries in the U.S. Some, like Villa from Villa’s Market on the Arizona side, say the lower prices aren’t enough to outweigh the hassles of crossing to shop. The store has been open since 2005, but the Villa family has been working in grocery stores and wholesale distribution on either side of the U.S.-Mexico border since 1978. Others are more hopeful. Many emphasize that not everything is less expensive in the United States, evidenced by U.S. citizens crossing into Mexico for medical tourism. The nature of the economic ties between Arizona and Sonora, Teal said, is “astounding.” While Mexican businesses and citizens may be facing a tough deal with lack of competitiveness on the border, they don’t hold that against the United States. 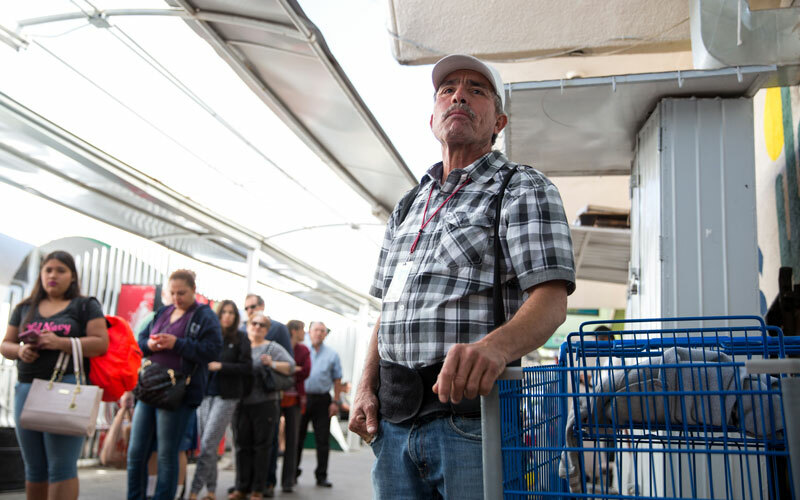 Some, like Jimenez, believe more development on the U.S. side would be beneficial — Nogales, Arizona, is low in retail development, and its primary economic function is in produce shipment and warehousing.